Come try our new forecasting tool at E-World! 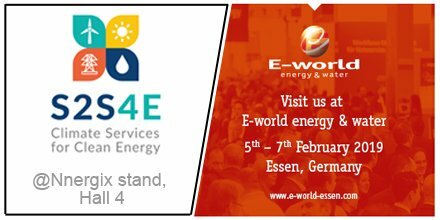 S2S4E will be at energy and water trade fair E-World in Essen from 5-7 February. Come by our stand to try our new weather forecasting tool for the energy industry! Here you will be able to try an early trial version of the tool and give us your feedback about what you think about it. You will find us at the Nnergix stand, within the Innoenergy startup hub in exhibition hall 4 (booth number 647). A beta version of the new Decision Support Tool – named RESILIENCE – will be officially launched in June. The tool is being developed by S2S4E, which is a project funded by the EU’s research and innovation programme Horizon 2020. S2S4E – which is short for “Sub-seasonal to Seasonal Climate Predictions for Energy” – aims to provide more reliable and usable forecasts for weather-dependent solar, wind and hydropower production, with prognosis ranging from one week to four months ahead. S2S4E is also working to develop more credible long-term outlooks for energy demand and supply/demand balance, which are also highly weather-dependent, especially in countries that rely on electricity for heating and cooling. E-World is Europe's leading trade fair for the energy and water industry, and it takes place every year in the German city of Essen. You can read more about E-World here.